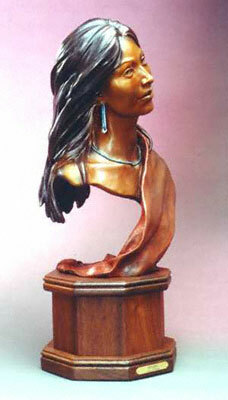 Susan Kliewer, Changing Woman, Bronze, 60" x 21" x 12"
Susan Kliewer, a native of California, has lived in Arizona for nearly 30 years, five of them at Marble Canyon Trading Post in a remote area of Northern Arizona near the Colorado River. Susan Kliewer, Julian, Bronze Edition of 45, 28" x 12" x 12"
Dreams of horses, deserts, canyons, rivers and sunsets have been her constant companions since she was a child. A painter since the age of 10, she turned to sculpting in 1987 after working in an art casting foundry for 10 years. 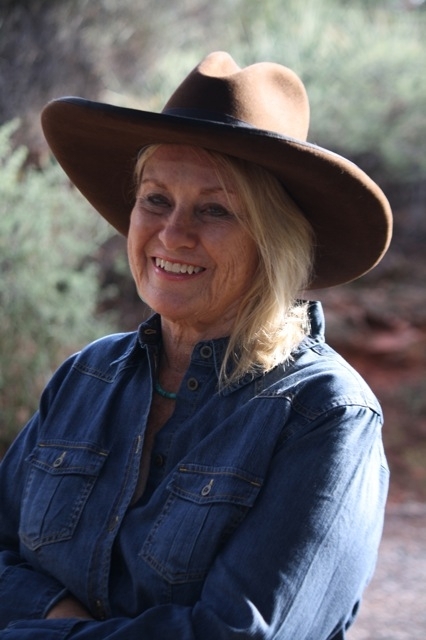 Susan Kliewer, Kinaalda: Coming of Age, Bronze Edition of 50, 11" x 12" x 27"
Susan won a competition to create a monument of Sedona Schnebly. The ten-foot tall bronze figure was installed in front of the Sedona Library in 1994. Her life-size fountain portraying the Sinagua people and a fountain of a Hopi Water Maiden are also to be found in Sedona. Susan Kliewer, Lozen-Warrior Woman, Bronze Edition of 45, 11" x 10" x 28"
"My work," she says, "aims to show the common thread that underlies all human experience, and which I hope brings us to a greater understanding between all peoples." 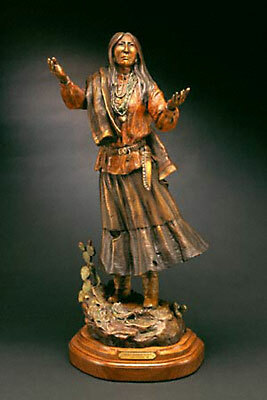 Susan Kliewer, Maynard Dixon: At Last I Shall Give Myself to the Desert Again, Bronze Edition of 45, 24" x 12" x 9"
2009 - First Place Award, Sedona Art Center Annual Show "Southern Plains Dancer"
2008 - First Place Sculpture Award, Cowgirl Up, Desert Cabelleros Western Museum, Wickenburg, AZ "Mischievous Ones"
2001 - Won the Olaf Wieghorst Award at the 32nd annual Contemporary Western Art Show and Sale, held at the Mountain Oyster Club in Tucson, Arizona for sculpture "Fancy Shawl Dancer." 1992-1994 - Sculpted "Sedona Schnebly" for City of Sedona, a competition sponsored by the Red Rock Arts Council. "Sedona Schnebly" stands 10 feet high, and is installed in front of the Sedona Library. 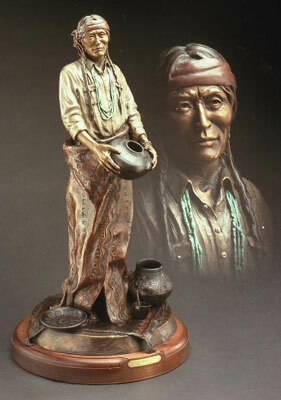 1993 - Juror's Award, Sedona Sculpture Walk for sculpture "The Gift." 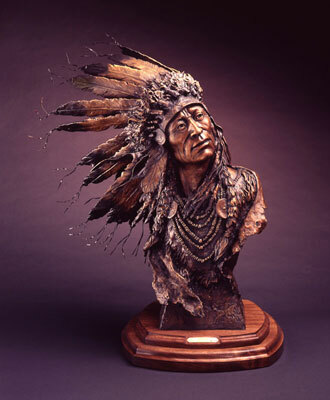 1991 - Won People's Choice Award for Sedona Sculpture Walk. Sculpture: "Navajo Sport." 1990 - Enlarged and sculpted Borglum's "Cowboy at Rest" monument for the city of Prescott, Arizona. 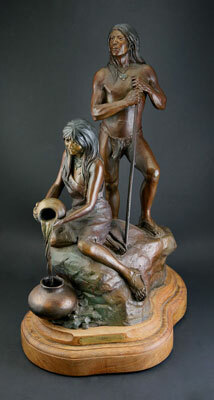 Susan Kliewer, Spirit Wind, Bronze, 29" x 14" x 21"